Card: A couple of years ago I went to Malva in Joburg - seeing little Jozi Star's (that's the doggie) face is just the cutest thing. The Pretty Blog's Card: I am a big fan of the blog and how hard their team works. Plus, I love the chevron print. Sarah from Urban Lace's Invite: Sarah got married last year and I worked on a range of goodies for her wedding. The invite is designed by the talented Amelia of Whimsy fame. The colours, layout and 'prettyness' makes this one a keeper. Charms and Trinkets: Scrabble letters, a magnet or two, cabochons and a range of knick-knacks. I love these random bits and pieces. A few of them are from the Hey Cherry girls when they had a market stall, others are really just odd finds or gifts from friends. 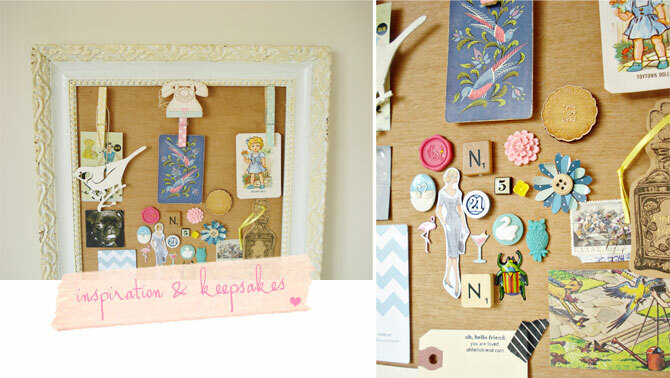 Do you have a mood board or special things that you keep? I don't have one yet, but I'm looking for one.